Madison & Marcela, located in a small seaside town in the low country of South Carolina, has hit a grand slam home run with three very different toffees. Chocolate Covered Peanut Toffee is a heavenly product—or perhaps a devilish one, as once you take the first bite, the bag is all but gone. CranAlmond Toffee (for those who want their antioxidants) is a beauty: cranberry-studded toffee on one side, lovely white slivered almonds on the other. For those who like things simple but perfect, Madison Crunch is a double-layered pecan toffee. All of the ingredients are USDA-certified organic, with the exception of the chocolate on the Chocolate Covered Peanut Toffee (which is the excellent Callebaut brand from Belgium). The sweetener is raw cane sugar mixed with agave nectar. The agave nectar adds flavor dimension while cutting down on the sweetness (and it’s much lower on the glycemic scale than sugar—not that we’re claiming this as health food). Yet with all this organic goodness and handcrafting, the candy is still so inexpensive that you’ll want to order lots for party favors, stocking stuffers, teacher gifts, and just to hand out, because they taste so good, they put you in a munificent mindset. 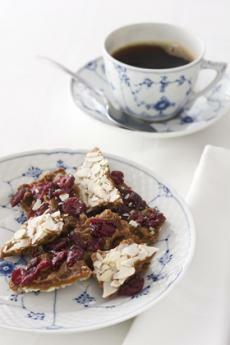 CranAlmond Toffee: ruby-like cranberries on one side, ivory almond slices on the other. Photography by Saidi Granados. While we discovered these toffees months ago, we wanted to put them on hold as a last-minute Father’s Day gift. If you haven’t yet remembered Dad, Grandpa or Uncle Sidney, here’s your chance. Take a closer look at all three flavors in the full review at TheNibble.com.